Zambia is faced with a big challenge of poor solid waste management and of all the waste that is generated, plastic pollution is at the top of the list of the waste generated countrywide. Currently, there are no laws or regulations that ban or regulate the usage of items made from plastics such as carrier bags and bottles to mention. Poor or nonexistent solid waste management services in some areas, and high levels of illegal dumping of waste in public places coupled with poor hygiene practices among the people have contributed to the biggest challenge of environmental pollution being faced by the country today. These challenges have not just contributed to blockages of township drainages which cause flooding in the communities during the rainy season, a high rate of sewer blockages, and pit latrines filling up faster than expected, but have also contributed to outbreaks of epidemics such as cholera. To address these challenges, the government working with various stakeholders such as cooperating partners, non-governmental organizations (NGOs), civil society organizations and corporate entities have been implementing a number of programmes to deal with these challenges and raise awareness on issues to do with health and hygiene promotion in communities across Zambia. This is being done through various platforms such as World Environment Day and other national/international commemorations. This year’s World Environment Day was characterized by pre-event activities such as popular theatre in communities, advocacy against plastics use and engaging chain stores such Food Lovers to practice a “no plastic day” during the commemoration of World Environment Day. Activities for the actual day included awareness walks, speeches and exhibitions. 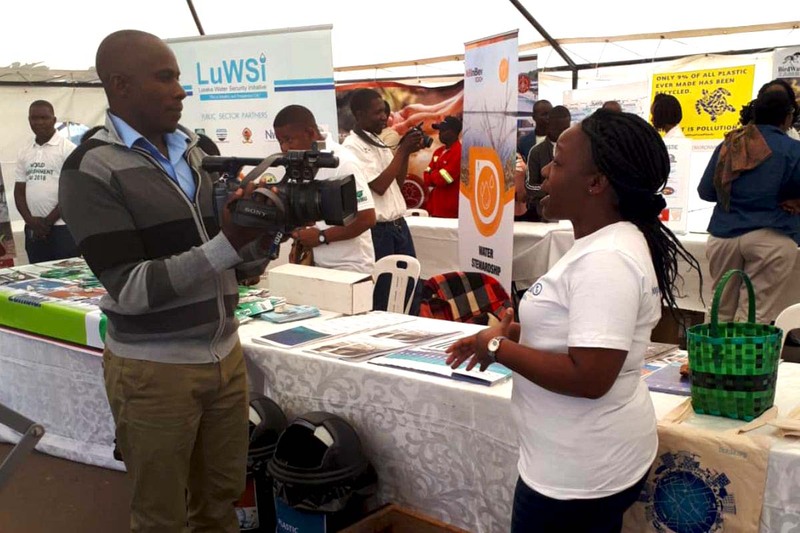 BORDA Zambia was among the organizations in the sector who took part in organizing the event and the awareness walks as well as being among the exhibitors at the event. 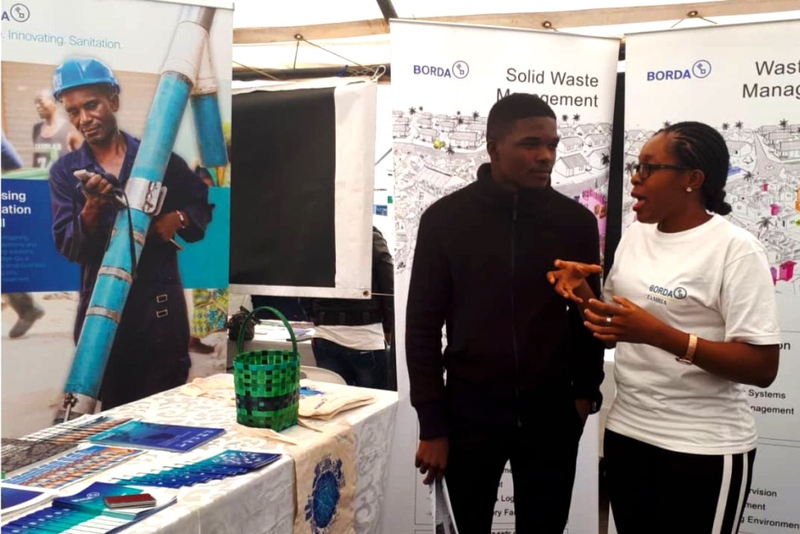 At its exhibition stand, the BORDA team showcases the services offered by the BORDA in the area of sanitation and solid waste management. The team also highlighted the projects that have been undertaken by the organization working with partners in Zambia. 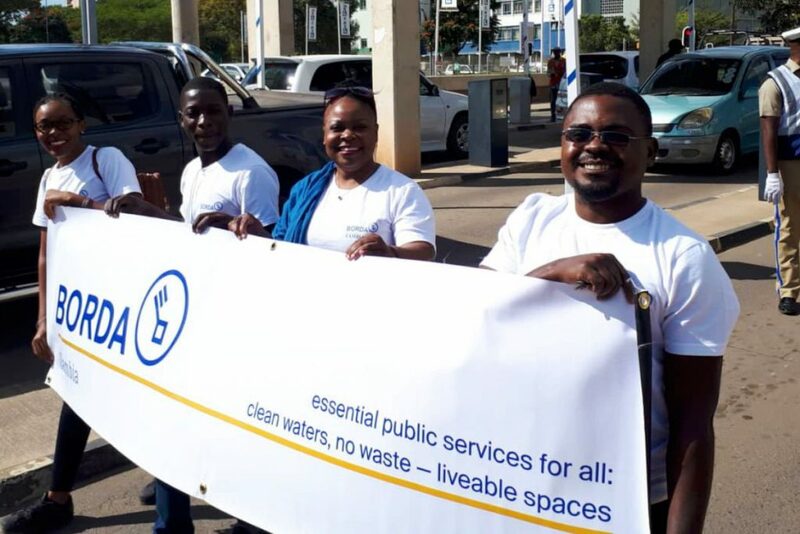 In line with the World Environment Day theme, the BORDA Zambia team developed a poster titled “Plastic Pollution – A Nuisance in the Sanitation Value Chain" which was used to sensitize the general public to the negative effects of plastics in sanitation services. An observation has been made that most of the faacal sludge received at the treatment plants in Chazanga and Kanyama has a high content of solid waste including plastic bags, bottles and diapers, to mention but a few. BORDA Zambia’s messages were mainly focused on promoting health and hygiene through sustainability of services by highlighting the need for all key players to get involved in ensuring that these services are sustained. Other key issues highlighted during the exhibition were the need for people to develop a good habit of solid waste separation at source and use of alternative bags made of other materials besides plastic. The general public was also sensitized to dispose of waste in designated places instead of inpit latrines or sewer network lines.